The outlook for the global economy turns darker, as the world braces for blowback from US-China tensions and Brexit. Is it all doom and gloom? 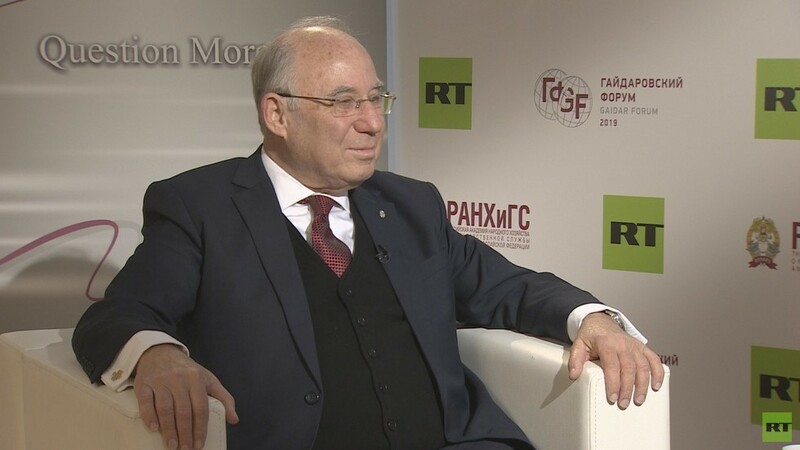 We ask Dr Jacob Frenkel, chairman of JPMorgan Chase International. Sophie Shevardnadze: Jacob Frenkel, it is really great to have you on our show today. SS: Alright, so lots to talk about. After last year’s Davos summit you have actually cited the growing global debt level as a concern, but this year we have the China – US standoff that you think is also a big problem to the global economy. Do you think we are looking at a recession to come? JF: Well, the important thing is to recognise that the world is a very global entity. Countries in the world are interconnected and therefore it is in a way against the nature of the integrated world to have barriers and to create trade tensions, so as an introduction I would like to say that in my judgement the Chinese – US standoff as far as the trade skirmishes is the major issue. But you are perfectly right that we arrived to this year which is the 10th anniversary of the large financial crisis - crisis that started from large debt levels - we arrived to this year from the legacy of large debt levels, and now we see the debt continuing to grow. So together, the rising debt which is fragility of the financial system and rising trade tension, which is fragility of the trading system can translate itself into fragility of the world international order and that’s something to watch for. SS: Do you think the same as your colleagues from JP Morgan, that 2020 is the year when the big recession is going to hit the world and we are going to see the social unrest unseen since 1968 and if you think that’s the case, do you think it could be averted and how? JF: Well, I think thatnot all of my colleagues think that way and our diverse views are all over. And in general when I am driving and I see a wall it is very important to warn and say: “Be careful! There is a wall!” I can declare that there is a crush, or I can say: “Change the direction, prevent the accident!” So I think that what is now called for is to sound the alarm and say: “If we are not going to change something, this will not end up nicely.” But we have the opportunity to change, we need to change, because there is too much to lose. I just want to say that while a decade ago, in the height of the crisis, the feel was that ground disappears and we are going to implode. Most of the economies of the world today are doing reasonably well. Yes, we can see in the highlight well that the difficulties are, but the world has resumed its growth in fact all the regions of the world are now growing in a positive way, so we need to look at it with this perspective. There is a lot to lose, there are some dangers, but we are not coming to it from a crisis world. SS: Would you say that we completely passed the 2008 crisis? You have said that this year is the best year since 2008, but we still see falling wages even though you are saying most of the economies are doing great. The inequality between rich and poor has grown drastically never seen before, it’s almost like being hit by ripples from a bomb that was dropped ten years ago. Do you think we ever going to be pass 2008 completely? JF: In a way I should say that I hope that we should not. In a way, what we should always have is the memory of that event so that we don’t repeat the mistakes. It is in the sense that it will stay with us. However, many of the flaws that characterise especially the financial system have been remedied, but the problem is that the crisis of tomorrow will not be the same as the crisis of yesterday, so we need to deal with resilience. You know, there are always three phases, when we talk about crisis, there is a crisis prevention phase, there is a crisis management phase and there is a crisis resolution phase. Crisis prevention is the most important one and it’s the most boring one. Politicians wake up normally only when they see danger and if you tell them “just prevent the danger”, they say “we don’t see the danger, what is the problem”? So that’s something to watch for. I think that the system now, you mention properly, has a lot of tensions in it that come from a very large gap between the rich and the poor, the distribution of income, the distribution of wealth, and the feeling of large parts of the population that somehow they do not benefit from the overall growth of the economy. This is something which is par excellence public policy challenge that needs to be addressed. SS: But also I feel like the consequences of 2008 are not just economical, I think it is like social and political because falling economy means frustration of the masses, you brought that up at the beginning, which leads to the rise of what is called populism, the rise of other forms of discontent like Yellow Vests in France right now, so like a very serious thing. Do you think we will see more political consequences of 2008? Do you feel like the global community, politicians that you are talking about, economists are ready to prevent this new financial crush? Are we better and more prepared right now? JF: Well we may be more prepared but the challenges are also bigger, because one of the unfortunate outcomes of the 2008 episode was the loss of trust. The feeling that somehow leadership is not leading us to where we want to be. And it is true in the corporate sector, it is true in the political arena, it is true in the social sector, somehow large parts of the population feel that they are not being led properly, which means there is this kind of aura, which I am not sure is correct, which means there is the aura of our leaders have failed, experts have failed, and what does it mean? It means “let’s take new leaders, let’s take non-experts, let’s take complete outsiders and if somebody was in the system before, he is already disadvantaged”. I can see the kind of emotional attraction to this, but there is a great danger. SS: Do you think this gather behind like the “out of the system” character that is very fashionable all around the world right now, do you think that will not lead people to a good place? JF: No, it is a very dangerous area. And the reason is, the world is very complex. You really need to have the experts. You cannot allow amateurs to drive these complex cars or to be pilots of this plane. SS: Yes, but the people will tell you that experts have failed people and we don’t trust them anymore. I mean, the way I see it because a lot of people criticise Trump right now for being protectionist, for waging trade wars. But you know, a lot of experts are saying “do not kill trade, do not do protectionism this is really bad not for American economy but for the global economy”, but then there are people who are gathering around him, and the way I see it, Trump is just an example, it could be anyone else in his place. It is a broken trust between the society and the financial and economic elites and that needs to be restored. JF: You are absolutely right. So identifying the problem is phase number 1. Phase number 2 is identifying the solution. The solution does not mean “take amateurs to drive the complex cars”. The solution means “let’s learn from history what has worked and what has not worked”. History did not start with Trump. And you are absolutely right, Trump is not just a name of a person, it’s a name of the phenomenon. So you have Brexit crisis in the UK, you have the entire issues in France, the Le Pen, the Yellow Vests, you have in Hungary, Orban and lot of populism over there, I think the entire issue of demography, of the refugees, of migration has in a way preoccupied the policymakers time and attention in Europe and diverted attention from the growth and social equilibrium objectives, so all of those are right, but history started much earlier and we have one lesson from history: openness helps. Millions of people all over the world have been elevated from poverty because of access to technologies from abroad to trade, to education, to knowledge. Openness is not just trade, openness is a mindset, mindset that says “let’s get the best from everywhere, not only from what we produce”. And, therefore, since the storms do not happen exactly in the same time in all places, it’s a great privilege that when I have a challenge I can benefit from the prosperity of the other country through trade, because when the next round comes and they have a challenge, they will benefit from the prosperity for my country. So international trade, and commerce, and services, and finances, and knowledge, and people have proven to be the key for economic prosperity and growth. So let’s not allow short-term considerations and short-term satisfaction, which are psychological, to destroy the trade that gives us the fruits. SS: But you know, like an average person will tell you “I don’t want to think 20-30-40 years ahead, I want to take care of my life now”. And yes, the pro-protectionist people that came to power, like Trump, and he wants to kill all the trade deals that were working for tens and tens of years and were working fine. But then he will tell you, “I’ve created 3.5 million jobs”, and people are quite happy with it and I don’t think they want to think ahead 30-40 years of “let’s not kill trade because protectionism is bad because in 40 years you will live better.” What are you going to say to them? He has created 3.5 million jobs for Americans, right? SS: By being protectionist also. JF: And by being opened to technology and to knowledge and to extraordinary human capital that has migrated into the US and has contributed to it. It is not a very simple thing, but if you ask me “So, why do we need.. what is leadership about?” Yes, the average person says, “I want to make sure that I finished the month happily, and that I have a good meal on my table and that my family is taken care today, tomorrow”. And the role of the leader is to come and say, “Let’s make sure that it happens not only today and tomorrow, but also next year and the next century”. Yes, leaders really need to have a compass, which is more farsighted than the one of the families that are under pressure, I am not grading them, they are not below intellectually or anything else. But we must understand that in order to enable their children to have what they want to have, we need to create the infrastructure and the world order that will bring it about. SS: So, the class of people that were hit the most by the economic crisis that turn into social unrest is the middle class, in the West, and they are saying, “Hey, you know, we want economic equality”, because meanwhile, while they are being hit by the crisis the elites are getting drastically richer and richer and that’s an undeniable fact, so do you think what they want, this equality, will be beneficial for the global economy? Let’s say, we just start this massive anti-trust “tax the rich” all over the West, do you think it’s a good thing for the global economy? JF: I think that you are bringing a very deep issue, which has been in debate for ages among economists: the trade-off between efficiency and equity. How can you ensure that when you are helping the society to be more equitable through transfers from the rich to the poor etc. that you also maintain efficiency in the economy so that you don’t cut the trade that gives you the fruits. What do I have in mind? I will take it to a paradox. Suppose that you cut half of the GDP, the product of the country, and you take that half and you distribute it equally to everyone. You will win the Nobel prize by saying “I have full equality”, but you have equality of misery. You want to make sure that the equality is not just a slogan of misery but it also is associated with rising the standard of living. How can you have a rise in the standard of living? By having people who are richer, saving, investing, broadening, increasing the size of the national pie so that we can distribute more to everyone, so if you are going just to tax the rich mindlessly, the rich, so-called, what will they do? They will say, “Why should I save? I am going to be taxed anyhow. So I will cut my saving. And I will give a big party. And we will sound happy, we will have more to consume.” But for the next generation there will be less because we have not saved. And why haven’t we saved? Because the government is about to tax us and distribute it. So, there are delicate issues of how to achieve social norms that bring about taking care of the poor and the equality and at the same time not destroying the future. And therefore, I think I want to put only one major principle on the table. The key issue is not equality of income, the key issue is equality of opportunities. We really must make sure that those who are underprivileged parts of the society have the opportunity to elevate themselves so that over time their children will be in a better part of the society. Where does it come? It comes not by giving them meal on the table per se, but by giving them education, by giving them the earning power to do it and that’s not just by distributing the pie. SS: So, if we speak as of today, would you say the gap of access to opportunities is as wide as the gap between rich and poor today? JF: I am not sure I can generalise it, but I would definitely use that metric to access the pictures that I see. So if I see today large inequalities especially in the US that are between the Black, the Hispanic, the non-minorities, you have great gaps. And it creates social tensions, it brings about crime and it really destroys the generation. The way to go about it is not by saying “let’s punish them and put them in jail”, but by asking what brought it about - “how come, the kid had to go to the supermarket and steal a loaf of bread? Why isn’t he at school during that time? What is happening to the parents etc. ?” That’s where education comes in. I really put the highest weight on education and I think this is the key for the future. SS: A lot of experts are also saying that driving engines of the world economy in the future are going to be China and India. Do you agree with that? And if that’s true, then maybe we all should sort of relax because they are going to pull us through? JF: China and India are indeed different from each other in terms of systems etc., large populations of course. They have been growing at a very rapid pace and in few years, not many, China will surpass the US. To me this doesn’t mean “can I sit down and relax because they will carry the day?”, but rather “how do the major parts of the world, in this particular case the US and China, make sure that there is positive interaction between them?” And there is now greater awareness that those two pilots of the world economy need to talk to each other. You know, I told you that in many countries economic conditions are now, as measured, much better than they were a decade ago and yet people are worried, are very worried. And I ask myself – why? I have a feeling that people... You and I are sitting now in the armchair, we can have a nice coffee, we can talk, but if I am telling you that the two pilots in our plane are not getting along with each other, you will not be very happy to sit in the couch even if you sit in the first class and you are on the plane. People are nervous when they see that the two major countries in the world are in confrontation. You can call it negotiations, or you can call it confrontation and the difference between them is very delicate and I very much hope that trade discussions today between China and the US will move in the right way. And you will be surprised, once there is a positive indication, how much the mood in the world (and the financial market is the best referendum about the mood) is going to be picked up. SS: But how can you have a win-win situation at this point, because someone will have to give in, either China or America, and I don’t feel like anyone is wanting to bend? JF: There will be a win-win because the nature of trade is a win-win project, the nature of trade is “I trade with you – you trade with me – both of us are better off.” And therefore, if we upset that equation, both of us are worse off, and the trade negotiation are the skirmishes about “who gets more of the overall benefits”. And we need to be careful, that the two sides get less from overall benefits that are their possibility. There are genuine issues and each side must give up on the less important parts. I will give you an example: in the US there is a very strong feeling especially when it comes to technology, the property rights on technology, that China is not playing fair game in taking intellectual property rights. So for the US it’s a very important thing. This will be the key. Then there are the bread and the butter. JF: Well, you have a different leadership today in the US and a different leadership today in China and both are not so different, but the important point is that… that’s why it is tough, but really the stakes are very, very high. The only way to justify a trajectory that needs to be taken is by recognising the damage of the alternative trajectory. SS: And what is the damage of the alternative? What is the worst-case scenario? JF: Fragmentation, trade wars. Listen, the world is very complex, so if the US is imposing tariffs on China, China is importing less inputs from the rest of Asia, allies of the US. The incidents in the war are very different from what is intended, you try to damage China, you damage your allies, you have an issue, the world is much more complex, you have Europe along the way. I really think that the population of the world will benefit much more from openness then from closeness. SS: Jacob Frenkel, thank you very much for this interview, all the best of luck with everything.